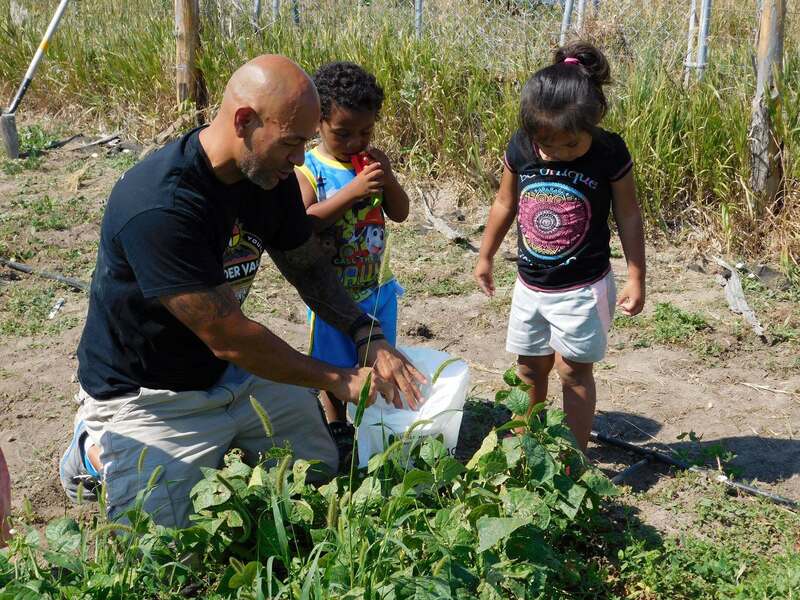 How they are empowering Lakota youth to be involved in the food that comes to their plates. Nick Hernandez is empowering Lakota youth to be involved in the food that comes to their plates. THERESA MARQUEZ: Hello, and welcome to Rootstock Radio. I’m Theresa Marquez, and I’m here today with Nick Hernandez, director of the Food Sovereignty Initiative on the Pine Ridge Reservation. Nick is also an enrolled tribal member of the Oglala Sioux tribe. Nick, as the director of Food Sovereignty, I think it would be great for our listeners to hear you talk about what does food sovereignty mean for you? NICK HERNANDEZ: Food sovereignty is one of those terms, you know, those growing terms. And for me, being a Lakota person, food sovereignty for us here goes along with our term, our saying, “Mitakuya Oyasin,” we are all connected. And so food sovereignty for us is making that spiritual connection with everything that goes into what nourishes our body. And so, I mean, that’s kind of our overall term or connection. That’s food sovereignty to me, and to us as Native peoples, and I guess the peoples who kind of acknowledge the term food sovereignty. TM: Well, clearly, 150 years ago or more, the Native Americans were feeding themselves extremely well, very healthy. You know, really, if we were to look back, which I’ve tried to do a little bit and talked with others, it was almost a kind of a diet that we’d all like to look at and try and copy in many ways. And then, now, things have sunk down so much that there’s a lot of obesity, diabetes, and so on. So is part of this food sovereignty trying to re-create or go back to what was in the past just a really good diet for you? NH: Yeah, I mean, I guess going like pre-reservation, precolonial periods, I mean, food sovereignty, to us, is what we did, you know. It was our normal lives. And so like our diets, in various but mainly for the Plains tribes, our diets revolved around buffalo and things that we harvested off the land. And so our diets change with the forced assimilation and stuff, and with the changing environments, our diets changed from a hunter-gatherer lifestyle to a more sedentary, more processed food system. And so for us, the food is always evolving now, but for us as Native peoples, we understand that connection to the food and its relevance to the nourishment of our body. And so for us Lakota people, I mean, buffalo was one of our staple foods. It provided the protein, and how you processed it, the minerals that you pull out of meat. And buffalo, to us, are kind of our livelihood. It centered around everything from not only providing sustenance to our life but also provided sustenance to the ecology, to the earth, to the environment, to us having tools and homes and everything. And so food, to us, is, to our spiritual well-being, is the center. It’s the center of what food sovereignty is, the center of what Native people, Lakota people—it’s in our thought process and it’s how we reconnect ourselves. TM: Are you able to raise any buffalo out there now? Isn’t it thousands of acres in South Dakota where the reservation is? NH: Yeah, I mean, for here, on the Pine Ridge Reservation, home of the Oglala Kopa Yate(? ), we have roughly about 2.7 million acres, which is divided up in various segments and stuff. But reservations, the majority, especially in like to the Plains tribes, were developed as cattle-driven economies. So for here, on the reservation, our buffalo once roamed the entire Turtle Island; they once roamed the United States of what it’s called today, once roamed over 60 million buffalo. Here on the reservation we have 5,000 head of buffalo in comparison to 96,000 head of cattle, because the United States is a cattle-driven economy. And so buffalo, for us, we’re trying to help regenerate our relatives. But that’s a slow process. I mean, that’s a policy-driven process that comes behind it, but we see the value in regenerating our relatives. TM: You know, I notice that you’re involved with so many very dynamic programs. So the Thunder Valley Community Development Corporation, which I think you call it the Thunder Valley CDC, tell us a little bit about that and about the people and the youth that are involved in that. NH: Yeah, we’re an organization. We had, we were on our tenth year as an organization last year, so we’re on our eleventh year as a local, grassroots, community-based organization here on the Pine Ridge Reservation. We have a development, a community development that we’re building now on 34 acres. And our community development consists of providing housing—we have a housing shortage on our reservation, but also we have other disparities that come along with lack or loss of a safe, sustainable economy. And so our community development is focusing on regenerating these things—housing to home ownership, to workforce development, to enterprise development, to food sovereignty, language development. I mean, we have nine initiatives that work as an ecosystem of opportunity. And so everything that we create here works as a full system for rebuilding—rebuilding nations, rebuilding communities. And so we’re focusing on rebuilding ourselves as a once-thriving nation with modern technologies and incorporating what it means to be Native, what it means to be Oglala Lakota, in everything that we do. And so we’re in our tenth year of development, and we have houses that are standing now, and we’re working on creating facilities to expand in food systems development. So we’re doing a lot—I mean, we’re doing a lot. I think our overall project for here at Thunder Valley is like a $60 million project. And it’s only one site—I mean, we’re a 100 mile by 100 mile reservation with 20,000 people who live on the reservation, and so we’re making large impacts for a large community. I think we’re one of the fifth-largest plan-based tribes across the nation here. And so what we do here not only affects our local community but we envision on affecting all communities that want to see change. TM: Well, you know, I was excited to listen to you about the housing project, but also your community garden project. Is that on the 34 acres? NH: Yeah, we have, the Food Sovereignty Initiative has 2.5 acres within the 34 acres that we’re creating an educational demonstration farm. And what we’ve incorporated it as a regenerative poultry center to agriculture And so we’re utilizing chickens as a way to create a food system and to regenerate the soil, regenerate the food system, regenerate economy. And we do that with every intention of in community empowerment. We have community gardens that we use to take part in that serve a purpose for training our local youth, for empowering them to be involved in what comes to their plate. And we have different aspects of education that play along with that and that go from curriculum to recipe manuals to community classes. And so we’re trying to touch on every piece of education so that we can all move forward, that we can all progress, that we can all create a healthy and positive community for our next generations. TM: Well, you know, it’s so exciting to hear about that. And you know, I’ve interviewed other people, and they talk about their community garden projects. They’re having some success by having kids in the garden, because a kid who will never eat a broccoli sees it growing and picks it and goes, “Wow, that’s not so bad.” Are you seeing that kind of thing here? Because I know on the rez you also have this obesity/diabetes problem, and you’re saying you’re doing education and all that. Are you finding that you’re able to get kids to like these things and also their parents to start cooking some of those things that are in the garden? NH: Yeah, I mean reservations, Native peoples, minorities are probably one of the most studied peoples in the world. And so, like for reservations, we have a lot of health disparities. But once it’s really focused and narrowed down, it all comes back to the food. It all comes back to the food that we consume, that we eat, that we put on the plates, that we connect ourselves to. And so for here, on the reservation, we’ve done a study. We’ve done a study with our food system and found out that basically 95 to 99 percent of our food is shipped onto the reservation. So you’re talking foods that are high in fat, high in sugars—I mean, just saturated, processed foods that come onto our reservation. And that less than 5 percent of the houses that are here, the community, grows their own food. And so for us to be food sovereign we have to create curriculums, we have to create recipes, we have to create texts that are locally based, locally focused, and locally driven, on the food system we used to have and the food system that we want to see. And so the curriculum is key. We’ve written the food sovereignty curriculum locally so that we can put it in the schools so that we can teach the next generation where their food comes from and how they can do gardening, how they can be more involved, and also give them the historical pieces of us as Lakota people, what that food looked like. I mean, we have a community garden here that displays different systems of growing, because we have people who have different needs—you know, need wheelchairs or want to do small-acre plantings and stuff. And so we create those opportunities to display, but also we have a school, a child care that has their own garden. So they have access, so that the farm-to-school idea, we’ve implemented it in our local school. We’re talking probably 18 months to five years of age, students and staff who have access to local produce that they put into their menus and their systems. But one of the big opportunities that we were able to engage in and bring in is that we put buffalo back on our youths’ diet, and it’s been a long time coming, but we’ve incorporated our traditional meats, our traditional food back into the menus of our schools across the reservation. And you know, these are big movements that we’re able to help change the mind-sets of younger generations and to build up their taste, to build up their opportunity and access to locally based foods. TM: You know, Nick, I know that you were raised on the rez and then you went to college, and it looks like in Durango, Colorado. And you are, you really have been trained to be a leader. How do you see yourself as a leader, and what is it that really is your inspiration for wanting to keep doing some very hard work that you do? And that’s how you learn, is by being in the soil, being in the ground. I mean, that was 12 years ago. Twelve years ago—I’ve been kind of connected in the soil for 12 years, and focusing on that reconnecting back to the soil, reconnecting back to the food, and trying to, changing my mind-set. Because being a college student, you know, I started to kind of round myself out in connecting back to food by being at the college that I was, because the college I went to was driven off social issues, environmental issues, and seeing the impacts that food systems have. And so I was driven even more to come home and wanting to make change. And the spark and my guide, my basically pusher to want to make change, was my grandmother. TM: Your grandmother. And my mother, too, really inspired me as well. One of your nine initiatives, I think, is a small demonstration farm that sounds like a pretty exciting program. Maybe you could tell us a little bit about that. Is it an organic farm, isn’t it? NH: Yeah, I mean, I could say we’re a majority of an organic farm. And so we have, like I was talking about, the 2.5 acres. It’s our regenerative poultry-centered agriculture system that we adopted from the Main Street Project out of Northfield, Minnesota. They’re our main partners for the adaption and for the adoption, for the creation, for the building of the food system that we’re regenerating here on the Pine Ridge Reservation. And it’s focused on chickens—it’s focusing on utilizing chickens for their regenerative output. So when we talk about regenerative, regenerative spans everything from quality of air to soil to how the food is developed to utilizing the animals for their natural abilities to provide for the ecosystem. And so we have 411 Rhode Island Red egg layers that are inside our system. And so what the system, it’s a multifaceted system for growing food. Right now we’re creating about 20 dozen eggs a day that we’re looking to get on the shelves of our local supermarkets, which they’re in; goes to the plates of our local community who haven’t had access to local foods in generations. And so we’re making those opportunities by the food systems that we’re creating, and looking to expand out the food system, the system that we have here, with 411 chickens, to basically grow out to larger systems and to create economy, to create food security, and to create food sovereignty overall. TM: I just love the chicken. One of our farmers says the chicken is the hardest-working animal in the world. And they’re so versatile, and is there anything more perfect than an egg, as far as food goes? But do you also grow chickens for broilers and for meat? NH: Right now we just have—for development, broilers would be one of the uses for the chicken. Right now we’re doing just the eggs. And chickens—I mean, chickens, they’re a dinosaur, you know. Just like the buffalo, buffalo are so generationally connected to the land that they occupy. Chickens are too, in Asia and where they come from in the Pacific areas of the jungles; buffalo for us. And chickens share the same capabilities of regenerating the soil. And then one thing coming back here is the chickens that we have here on our demonstration farm, I call them buffalo chickens, and keeping the emphasis that our buffalo were the center of our food system. But right now we’re utilizing the chickens to help us regenerate our food systems until our relatives, our buffalo, are repopulated. TM: If you are just joining us, you are listening to Rootstock Radio. And I’m Theresa Marquez, and I’m so honored today to be talking to Nick Hernandez, and we’re talking about food sovereignty on the Pine Ridge Reservation. Well, most gardeners will say how they love that chicken manure for growing the best vegetables. TM: So you’ve got two and a half acres. Can you scale up? NH: We’re looking to scale up dramatically, actually. The system that we have is just a demonstration system. To basically feed ourselves here, the 20,000 people that live on here, I was talking about elders and the youths and the adults and stuff—for the system that we have, that we’ve adopted, 100 acres would help us with the meat production, the egg production, and growing your vegetables, meat and vegetables. And so right now we’re looking to scale up to, from the 2.5 acres to 60 acres and to put a real thriving food system in action so that we can push to knock down that percentage of 99 percent of our food coming onto our reservation to tens of tens of percents being developed locally. TM: Well, you know, as someone who’s been in the organic industry for 40 years, this is pretty exciting. And food as medicine is just a very, I think, important topic. But I’m really interested in this idea of this demonstration farm and then scaling it up. I think that sounds really exciting. And when do you hope that you’ll get to the next 60 acres? NH: We’re looking to purchase land here within the next year so that we can scale up within the next year and start to take off with our local food system on a larger scale. So within the next year. TM: I want to just get back to some of your demonstration ideas that you’re working with, Nick, which seems pretty exciting and probably going to be very useful as you try to think about scaling up. I see that bees are on your list. NH: Yeah, we have four hives total now. It’s kind of been a process, learning about how useful they are, learning about our native species that we have of pollinators, and working with—we have a working relationship with the St. Louis Zoo. Dr. Spevak over there, of the Native Pollinators Institute [Center for Native Pollinator Conservation], is helping us to understand native pollinators and how significant they are to food systems development. But the one thing I’m really interested in is honey development for not only pollination of local foods but also for one of their prime resources is honey. So it’s a delicious thing and highly valued. And being the number two state in the United States for honey production, what a great way to regenerate in pollination, but also build an economy around such a delicious food also. TM: Well, I’m really excited about that, because of course all the things that are happening to the bees—we’re in the Midwest and not only do our bees no longer have the ability to survive our winters because of their compromised health and immune systems, we also are seeing the monarch butterfly go extinct. So I think it’s a great project. The other thing I’m really interested in is this coalition, the Lakota Food Sovereignty Coalition. I’m wondering whether you could talk a little bit about that. NH: Yeah, the Lakota Food Sovereignty Coalition is a coalition that we started back in 2016. And we wanted to be able to create a roundtable where our local community members or local organizations, our college, could be able to sit down and talk about food systems development. Because we have a lot of organizations here, locally, who have been in gardening, who have been creating farmers’ markets on a scale. And so we wanted to be able to have that place for people to come to and talk about their ideas, talk about their successes and accomplishments and what we envision overall, moving forward as a people together and regenerating a food system here. We’re basically a collective trying to work together to create huge change here on the reservation. You know, the more of us who become engaged, the more people who become engaged, the more people who get their hands in the soil, the more people who want to make change, the better movement you have. And so we know that, and so that’s the, the coalition is trying to make a huge impact by community engagement and community involvement. TM: I guess, as we kind of wind down our interview, Nick, I’d be interested in hearing you comment on what are the things that we should be learning from the Native Americans? I think that there are some things that we could be opened up to that we’re not open to now. NH: I mean, a lot has come to the forefront, dealing with food systems but also with Native Americans. I mean, Standing Rock, for us, was one of kind of the major events that helped bring to light the plights, the fights that Native Americans have been fighting for, for generations, for decades. What our culture and our spirituality has always been grounded into the environment. And environment is what we have. It’s what brings life to humanity. And so I guess what Native Americans bring to the table is that connection, that reconnection, that generational connection to environment and to community—community not only for humanity but community into every insect that ranges, every herd of buffalo that basically grazes the grasslands. But to understand that if we don’t take care of our planet and we don’t take care of ourselves, then we as organisms, we as beings, start to lose ourself. We start to lose our identity and our connection to who we really are, Uchimaka(? ), on this Turtle Island, on this spiritual star. TM: Beautiful. Thank you so much, Nick, and thank you for joining me today. So, for our listeners, Thunder Valley CDC, or thundervalley.org. And we can follow along and see how these great initiatives are doing. Nick, thank you so much for joining me today, and also for all the great work that you’re doing. And I am very thankful to be speaking with you today. NH: Yes, thanks for the opportunity to share our great work. And I look forward to seeing everybody down the road, helping to make a better life for the next generations.